Greater insights by the Hubble Space Telescope into the heart of the Andromeda Galaxy, the closest large galaxy to our Milky Way, are revealing a mixed environment of unusually blue stars and a ring of red stars around its giant 100 million solar mass black hole. The Andromeda Galaxy with the new Hubble image of its core, featuring the elliptical ring of red stars and the compact cluster of blue stars. M31 image: WIYN/KPNO; Hubble image: NASA/ESA/T Lauer (NOAO). 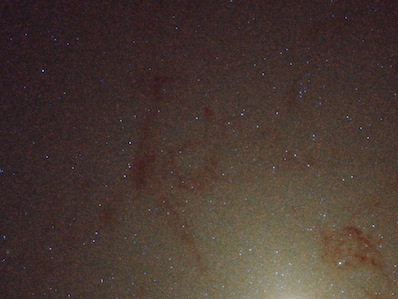 The central bulge of the Andromeda Galaxy (M31) is home to many old, red stars. So what are a population of very blue stars doing within the bulge? 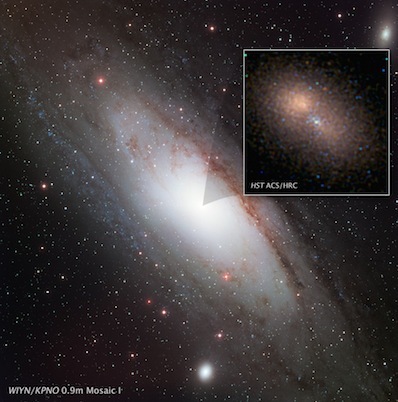 As part of the Panchromatic Hubble Andromeda Treasury survey to map different types of star across M31, a team led by Julianne Dalcanton of the University of Washington in Seattle discovered about 8,000 blue stars that have a strong ultraviolet component. Typically blue stars are hot young stars, but given that these stars are in the bulge where the older residents of galaxies lie, they must be elderly stars that have had their outer layers removed, exposing their hot interiors. The fact that they are dimmer and posses a range of surface temperatures different to the young blue stars in M31’s star-forming regions backs up this hypothesis. The results, however, which were presented at the American Astronomical Society meeting in Austin, Texas, have created something of a paradox. The distribution of the anomalous blue stars across 2,600 light years within the centre of M31 matches the distribution of X-ray binary stars within the bulge as seen by NASA’s Chandra X-ray Observatory. X-ray binaries involve one star stripping material from a smaller companion star, causing the gas to flow into a hot accretion disc around the stellar thief. The removal of material from the smaller star exposes the hotter, bluer layers underneath. However, if X-ray binaries were to blame, we would see similar stars with a blue/ultraviolet excess of light in other large galaxies where binary systems reside, and this just isn’t the case. This has left astronomers searching for other explanations. One idea is that the stars contain more helium in their cores, making the core hotter (higher temperatures are required for the nuclear fusion of helium rather than hydrogen) and this would cook the atmosphere from the inside out, says team member Phil Rosenfield, a graduate student at the University of Washington. However, their favourite explanation, Rosenfield says, is that these stars contain more heavy elements or ‘metals’ – elements with atomic masses greater than hydrogen and helium. The extra heavy elements help drive stronger stellar winds that can lift off an evolved red giant star’s outer layers. Blue stars caught lurking in the central bulge of the Andromeda Galaxy. Image: NASA/ESA/B Williams and J Dalcanton (University of Washington, Seattle). The dust then absorbs the star’s radiation, and the transferral of momentum from the stellar photons to the dust causes the dust to move away from the star on the stellar wind, dragging large amounts of gas with it. The greater abundance of heavy elements in the stars seen in M31 mean that more of the outer layers are lifted off than on a typical red giant, allowing more of their hot interior to be exposed. Exactly why these stars are so metal-rich is not explained, but the team are now working on computer simulations to attempt to determine which explanation is the correct one. Hubble has meanwhile delved even deeper into the centre of M31 to take the sharpest visible light image ever taken of the region immediately around its supermassive black hole. Although the black hole’s event horizon – its outer boundary inside which nothing can escape – is too small to be resolved even by Hubble, the image does show a cluster of blue stars swarming around it. Unlike the evolved blue stars discovered by the Panchromatic Hubble Andromeda Treasury survey, these stars are definitely very young, perhaps no more than 200 million years old and formed in situ around the black hole. Our Milky Way also harbours clusters of hot, blue, newly formed stars around its central black hole and the new findings suggest that such clusters may be common around black holes inside spiral galaxies. Encircling this blue cluster is an elliptical ring of ancient red stars, initially discovered by the Hubble Space Telescope in 1992. Back then it was thought that M31 had some bizarre double nucleus, but this was an optical illusion created by the stars moving slower at the farthest point in the ring from the black hole, giving the impression they were part of a separate structure rather than part of a single ring. The new image is the work of Tod Lauer of the National Optical Astronomy Observatory in Arizona, who combined images taken in blue and ultraviolet light taken by by Hubble in 2005 and 2006.